(Oct. 2, 2017) -- This fall's incoming class is the largest in school history at The University of Texas at San Antonio (UTSA) with 7,898 new students, according to a newly released report by the UTSA Office of Institutional Research. Additionally, the university welcomed 5,014 new freshmen, the largest class in six years. 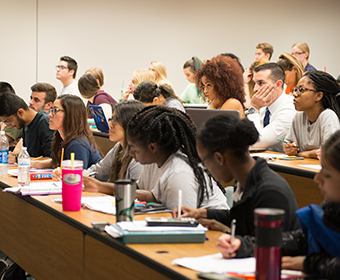 Overall, 30,674 students have enrolled at UTSA, which is known for excellence in academics, research and engagement. Nearly a quarter of UTSA’s freshmen are enrolled in the College of Sciences, where students study in one of six departments: biology, chemistry, computer science, geological sciences, mathematics, and physics and astronomy. With more than $26 million in annual research expenditures, the college is the most productive research community at UTSA. Faculty, staff and students in the College of Sciences make significant contributions in many fields, including nanotechnology, brain health, stem cells, medicinal drugs, infectious diseases and vaccine development, and cybersecurity, where UTSA ranks No. 1 in the nation. The majority of UTSA’s nine colleges saw a boost in overall enrollment this year. The College of Liberal and Fine Arts (COLFA) and College of Business (COB) have the largest student enrollments, with about 20 percent of Roadrunners majoring in programs in each college. COLFA, with 6,499 students enrolled, is UTSA’s most academically diverse college. It offers more than 80 degree and certificate programs in the arts, humanities and social sciences. More than 6,200 students are pursuing a degree in COB, one of the top five undergraduate business schools in Texas and the No. 1 Hispanic-Serving Institution in the nation, according to Bloomberg BusinessWeek. Bexar County remains the largest source of students attending UTSA. In all, 14,706 are from the San Antonio area. The second highest population (2,165) of UTSA students hails from the Houston area. More than half of UTSA’s undergraduate student population (14,310) identifies as Hispanic and 55 percent of new freshmen (2,741) identify as Hispanic. More than 40 percent of incoming freshmen are first-generation college students, the first in their families to graduate from college. UTSA also continues to have a diverse international population. This fall, 1,033 students from outside the U.S. are studying at UTSA, including 80 new freshmen. These international students represent more than 90 countries. Thirty-three percent of UTSA’s doctoral candidates come from outside the U.S. this year. UTSA is recognized as one of the top four young universities in the nation by Times Higher Education.